Jenson and Ricochet go on another mission to stop some Elite Forces from smuggling weapons from Enforcer Headquarters. But, an old adversary comes back. THIS IS DEDICATED TO DARTH MAUL AND EPISODE 1. FEAR. FEAR ATTRACTS THE FEARFUL:THE STRONG, THE WEAK, THE INNOCENT, THE CORRUPT. FEAR. FEAR IS MY ALLY. 2 weeks had passed since Dusty’s birth. Johnson had tried to act inconspicuous but it was hard for him since he was surrounded by enforcers. Johnson hated to be where he was, he was shaking in fear; fear because he was afraid that he would be found out. Johnson was one of Dark Kat’s special forces who was assigned to sneak in Enforcer Headquarters and steal some high-tech weapons. He had protested at the meeting they had last night, asking why he should be the one and they told him that since he was an old enforcer they would not suspect him. So Johnson had dug out his old enforcer uniform and was now in Enforcer Headquarters. “So far, so good,” Johnson said to himself. He rode in the elevator to the bottom floor where the room was that contained the weapons. He would hide out down there until that night when the enforcers would go home. There would be security up but Johnson had a security card which enabled him to go and wipe out the security until he was able to transport the weapons to his car. Lucky for him the garage was down on the same level as the room. That night around 12:00, the enforcers had left to go home, leaving Johnson there alone or so he thought. Jenson never went home he was always trying to do extra work so he could be promoted past Feral. Johnson had sneaked into the security room which he would disable the security. But when he walked in he discovered that he was wrong about how easy it was. The security controls were in a behind a gate and the gate did not use the same card as the one Johnson had. “Crud!,” Johnson proclaimed when he saw the gate. He looked over and saw a gray power box. “That will do,” he said and walked over it. He pulled back the panel which revealed a bunch of switches. Johnson smiled to himself and pulled out a flashlight, then flipped all of the switches when he did that, the sound of machines turning off could be heard and the lights went out. Johnson closed the panel door and walked back to the weapons room to get his assignment done. Meanwhile, Jenson was up in his office, typing up a report when the power out. “Oh, crud!!! No!! No! !,” he complained and banged the desk with his fist. He felt his way to the 3rd drawer on his desk and pulled out a flashlight. Jenson turned the flashlight on and got up. “Got to go fix it.” He walked over to a cabinet and opened it up. Inside was a black box. Jenson took it out and opened it up. His Dostovei was in there which he took out. Once he loaded the gun he walked to the elevator to go downstairs where the power switches were. Johnson was putting the second load of weapons into his trunk, when the power came back on. “What the heck?,” he said. He walked back inside the building and stopped when he saw Jenson walk out of the security room. Johnson froze when Jenson turned his way. “Hey, Johnson. Why are you down here?,” asked Jenson. “I was down here because I was in the garage getting ready to go when the power went out so I came back here to check on things,” he said nervously which Jenson could tell but he didn’t say anything. “Well, nice seeing again, Colonel McFurry but I have to be going now. Bye.” He turned and walked back to his car trying not to look like he was in a hurry. Jenson watched him walk out and knew that there was something up. He quietly followed Johnson and on his way he noticed the weapons room door was slightly open so he knew that Johnson had to have been in there. Johnson got into his car and started it up. He pulled away. Once Johnson was out of sight, Jenson ran to his hummer and got in. He started it up and followed Johnson being careful that Johnson didn’t see him. Jenson followed Johnson to a place about 50 miles south of MegaKat City. The place where some ancient ruins had been found a couple of years earlier. Jenson stopped his hummer far back enough so no one could see it. Jenson saw Johnson pull up to a bare place. Suddenly the ground was pulled back and kat dressed in a yellow suit walked up from a stairwell that was hidden underground. The kat shook hands with Johnson and then followed him to the trunk of the car. Johnson opened the trunk letting the kat look inside. A smile appeared on the kat’s face and he snapped his fingers. More kats in yellow suits came running up. These kats in the yellow suits were called Elite Forces. The Elite Forces started to pick the weapons out of the trunk and take them down the stairwell. Then when all of the weapons were taken, Johnson shut the trunk door and followed them. The cover slid back into place looking like ground again. Jenson nodded and knew that this was a mission for him and Ricochet. He took out his cellular phone and dialed the garage. Felicia and Jake were both sleeping when the phone rang. Felicia rolled over and picked the phone up from her night stand. “Hello?,” she said sleepily. “Felicia, this is Jenson. Sorry to call you this later. But we might need Ricochet down here. Johnson stole some weapons from Enforcer Headquarters so I followed him. But there are these kats with yellow suits and they have an underground hidden base,” Jenson said. “Okay. Where are you?,” asked Felicia. “I am 50 miles south of MegaKat City where the ancient ruins are,” said Jenson. “Ok. I am on my way,” said Felicia. She hung up the phone, Jenson did too. Felicia slowly got up. “What is it?,” asked Jake. “Jenson needs me. Another mission,” Felicia said as she started to change into her Ricochet outfit. “Want me to go?,” asked Jake. “That won’t be necessary. Besides someone needs to look after Dusty,” said Ricochet as she tied on her mask. “I will,” Ricochet said and kissed Jake good-bye. She walked over to Dusty’s cradle. Dusty was sleeping peacefully, Ricochet bent down and kissed him on the cheek. “Bye, Dusty.” She walked out of the room and down the stairs to the hangar. Once she reached the hangar, she got on her new black Kawasaki Ninja Bike that she bought a couple of months ago. She rode to the place where Jenson was. When Ricochet arrived she stopped at Jenson’s hummer and turned off the bike. “Hey, bro!,” she said. “Hey, sis!,” Jenson said. He got out of the hummer. “This way follow me.” Jenson led the way over to the hidden stairwell, Ricochet followed. “What is it? Just looks like dirt?,” asked Ricochet. “Exactly. But watch this,” he said. He got on his knees and began to blow the dirt away, revealing a large gray, steel door. The door had a button on it. Jenson pushed the button and the door slid back to reveal the stairwell. Ace and Ricochet loaded their guns and started to walk down the stairwell. The door slid back in place, the stairwell was lit with torches. At the end of the stairwell was a gold, brick wall with a triangle shaped cut piece. “Great. A dead end,” Ricochet complained. “I don’t think so,” Ace said and touched the wall that had the triangle shaped cut piece. The triangle rose up revealing a secret passage. “Just like the archives.” Ace and Ricochet walked in. On the other side of the passage way was a room with ancient pillars. Ricochet and Ace walked in but when they did, they heard the sound of an assault rifle being fired. They dove behind one of the pillars and then glanced around to see what that was. It was one of the Elite Forces. He shot at the pillar again. Ace fired back to distract him while Ricochet shot the guy. But another one got his sites on Ricochet, Ace saw him and shot him. “That was too close,” Ace said as he walked back into the clearing. “Yeah. Who are these kats?,” asked Ricochet. “Beats me. But they are very well trained,” stated Ace. He ran over to the other end of the room and found another hidden door. “This way.” Ricochet followed him. In the next room, it was separate by a large trench, a piece of the floor stretched across to the other side. 3 Elite Forces were on the other side behind some boxes. Ricochet and Ace ran to hide behind some more pillars. Then they took aim at 2 of them. Suddenly one of them threw a grenade at them. The grenade fell behind them. Ace saw it and his eyes went wide. “Move! !,” he shouted and ran to the platform to get across and shot at the elite force. Ricochet ran to the trench to follow Ace. The grenade exploded, the vibrations made Ricochet lose her balance and fall in the trench. She screamed. “I’m fine,” Ricochet said as she got off of the ground. “Right,” Ricochet said as she got her D5K into position. Rico ran down the hallway to wherever it was going to take her. The hallway was surrounded by a gold brick wall on both sides making it impossible to climb. When she turned the corner, there was another hallway but light was shining into as sunlight was creeping through cracks of the walls. On the sides of the hallway stood 2 elite forces and in the middle stood Dark Kat. The hood covered his face but his distinctable shape made it obvious that it was him. Dark Kat’s head was lowered to the ground and his eyes were closed. But his head rose up slowly as if he could tell that she was there. Dark Kat now faced her, his eyes opened quickly. He had no expression on his face but only a quick simple feral looking smile. He lifted up two assault rifles one in each hand towards her. Ricochet gulped knowing that this was it. She couldn’t defend him off when he had two assault rifles!! Ace ran in the hallway from the other way. He was panting as if he had ran a long way to get there; but it didn’t keep him from aiming his Dostovei at Dark Kat. One of the elite forces turned to face Ace and aimed his laser gun at him. 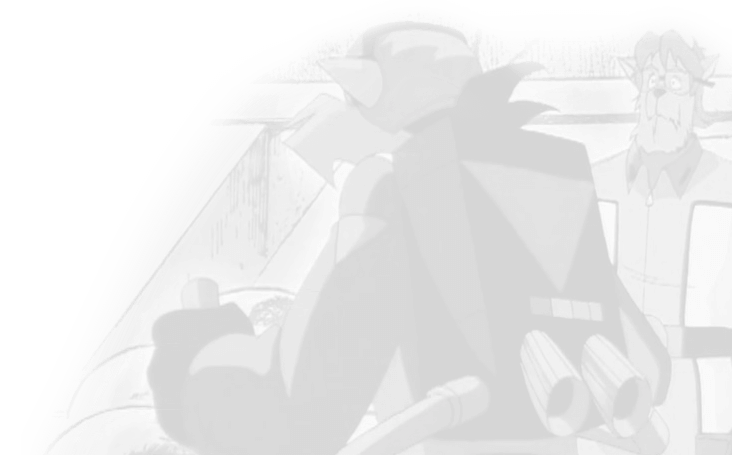 Dark Kat also took a glance over at Ace, when he did this, it gave Ricochet the opportunity to take a shot. Without even aiming she aimed her D5K at him and fired. Dark Kat heard her gun being fired and dragged one of the Elite Forces over in front him by his gun and the bullet struck the kat in the chest. The kat screamed in pain and then collapsed leaving Rico horrified at how cruel Dark Kat could be. Dark Kat turned his position to sideways and used peripheral vision to see both of them. He aimed one assault rifle at Rico and the other at Ace. He started to fire at them, they dodged out of the way. Then Dark Kat whistled and in poured a lot of elite forces from both sides of the hallway coming in from behind Rico and Ace. Rico ran over to Ace to have some support. “Get them!,” Dark Kat commanded. The elite forces opened fire on Rico and Ace, Rico and Ace returned the fire. While they were busy fighting, Dark Kat ran off to activate the shuttle. The shuttle that would transport the weapons that Johnson stole over to a hidden air base very far away from the city. Ace spotted Dark Kat running away from the scene. “Yeah? !” she shouted back trying to keep her attention to the elite forces. “Dark Kat’s getting away. I’ll try to keep these guys busy, you go after him,” Ace said. “Roger,” said Rico. She fired at the elite forces relentlessly making them dodge, giving her time to escape. When they dodged, she took off running in the direction that Dark Kat did, Ace covered for her. Dark Kat was climbing up the ladder that would lead to the platform where the controls were with Ricochet hot on his trail. She had reached the ladder now and was climbing up it behind him. “You’re not going to get away from me,” she growled to herself. Ace had decided to give Ricochet some back-up and had made a run for it to where his sister was. He reached the ladder and looked up to see Dark Kat nearing the top with Rico following him. Ace looked back and saw the elite forces approaching so he jumped onto the ladder and started to make his way up. “Looks like I will be joining you after all, sis,” he said to himself. Dark Kat had reached the top and was about to get off of the ladder when Rico grabbed his leg. “No, you don’t!,” she said as she pulled on his leg trying to hold him there till Ace arrived. “Let go of my leg! !” Dark Kat growled. He rose his leg up and kicked violently till he managed to kick Ricochet in the face. She let out a moan in pain and fell off of the ladder. “Sis! !” Ace shouted as he saw her fall. She fell on the ground but on her feet, fortunately. Ricochet got up but was unable to get back on the ladder because the elite forces that were chasing Ace had arrived and she had to fight them. Ace growled and continued to climb the ladder. Dark Kat was on the platform now and was running over to the controls. Ace had just reached the platform and climbed on top. “Hold it right there, Dark Crud! !,” he shouted and aimed his Dostovei at him. Dark Kat turned around and saw Ace ready to fire on him, he growled in frustration. He took out his assault rifles and aimed them at Ace now. Dark Kat and Ace did not fire yet but just looked at each in the others and saw the fire in them as they had great hate for each other. Dark Kat had went up against Ace before and had lost but now he was going to win. Dark Kat and Ace began to fire at each other, and dodging each other bullets by jumping behind boxes that were on the platform. Ricochet had managed to take down the elite forces and now was climbing up the ladder to give Ace some support. When she had reached the top of the ladder she looked over and saw Ace and Dark Kat shooting at each other. Suddenly Dark Kat shot Ace’s gun away from him leaving Ace speechless. “Huh?,” he said in confusion. This let Ace’s guard go down which gave Dark Kat the opportunity to shoot Ace in the right shoulder. “Aaahhh! !” he cried out in pain and grasped his shoulder. He had wide eyed look in his face and his face had look of shock on it. He fell down onto the platform floor. Ricochet saw this in horror. “NOOOOOO!!!!!! !” she screamed. Dark Kat turned his attention over to Ricochet and gave her a huge grin. Ricochet growled quietly to herself, there was so much anger inside of her now. She climbed up onto the platform and aimed her D5K at Dark Kat. Dark Kat gave her a yeah right look and aimed his assault rifles at her. Ricochet charged at him and before he had a chance to fire, she took her D5K and hit his guns out of his hands. Then she kicked him as hard as she could which made him fall off of the platform into the exhaust port. Ricochet smiled and pushed the button that would made the platform open up and made Dark Kat fell in the exhaust port. Then she ran over to the shuttle’s controls and changed its coordinates to land at the MASA. Then she pushed the launched button. The shuttle’s engines came to life and fire from their afterburner burned into the exhaust port. A smile appeared on Rico’s face. A smile that would scare Razor if he saw it. She was smiling by seeing Dark Kat’s torture. Rico knew that Dark Kat was down there and would be burned terribly by the flames and she was smiling at his suffering. The shuttle took off and left the place, on its way to MASA where it would landed. Rico ran over to Jenson who was trying to get up. “Are you okay?,” she asked. “Yeah. Dark Kat gone?,” asked Jenson as he took Rico’s paw to help him up. 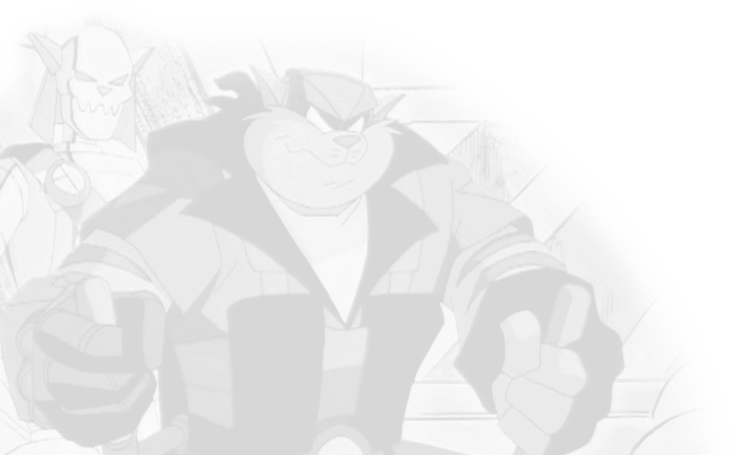 “Dark Kat’s gone,” Rico replied. “Good. Now let’s get out of here,” Jenson said as he stood up. They left the ancient ruins and head to the hospital where Jenson would receive treatment for his injury. But little did they know that Dark Kat did fall in the exhaust port but there was a side door in the bottom of it and which he got free from the flames from the shuttle’s afterburners. The side door provided a lot of safety for him but his cape did get scorched and was torn. Dark Kat rose up from the exhaust port growling with anger and rage. He had enough with those two. He knew he must be patient to get at them and not be impatient. Dark Kat would hide away for awhile and let them relax awhile and strike when they didn’t expect it.